My baby boy, Bransen's polka dot nursery is a blend of black and white polka dots and a lively mix of color contrasts and shapes. I fell in love with the stripes and polka dots baby bedding set and the cute puppy dog crib mobile that came with it but once it was in the crib I knew that the room needed more color. The black and white baby bedding had touches of baby blue but that just wasn't enough. To warm things up a bit, I painted the walls of Bransen's polka dot nursery a soft shade of orange using flat wall paint. Then, using semi-gloss paint, I painted large circles in a deeper shade of orange by tracing different sized circular objects with a pencil and painting them in. Using this technique not only provided the needed color contrast, but texture. You can't really tell from the pictures, but the orange polka dots on Bransen's polka dot nursery wall really stand out and look fabulous as a background to the black and white polka dot nursery bedding set that gave me the inspiration for the room's design. 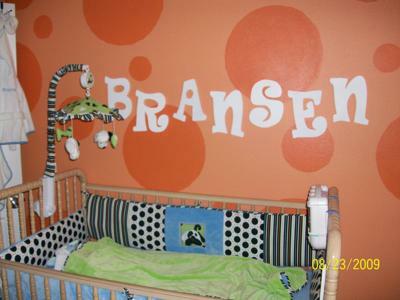 Thanks for sharing your pictures of Bransen's polka dot nursery and your bright and cheerful nursery ideas!